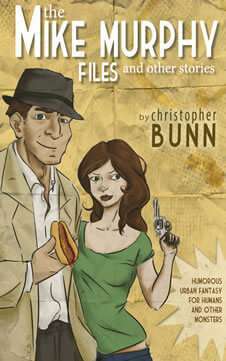 The Mike Murphy Files is a collection of humorous urban fantasy short stories. There are six of them, and the entire thing clocks in at about 30,000 words. The first two stories present the irrepressible gumshoe Mike Murphy. He’s a down-on-his-luck private investigator who isn’t magical himself, but lives and works in a world filled with odd and unusual creatures. All of this, of course, is set squarely within a city not unlike Manhattan. The third story, “The Inheritance of Polly Inch,” is a rather strange little tale involving a young lady named Polly (of course) who inherits an unusual collection of artifacts from her deceased archaeologist uncle. Her uncle had a bad habit of never paying his income tax, which means several IRS agents are involved in this story. Between you and me, however, they would’ve been much wiser to have steered clear of Miss Inch. The fourth story examines a modern take on Santa Claus. How on earth does the old boy make it around the world so quickly? The fifth story is a nod to my day job, which frequently involves interacting with various members of local government agencies. As I primarily write fantasy, I began this story wondering what would happen if dreary bureaucracy and fantasy met on the same page. The sixth and last story is “Ice and Fire.” This one is a love story, and that’s a rare thing for me. Enough said.